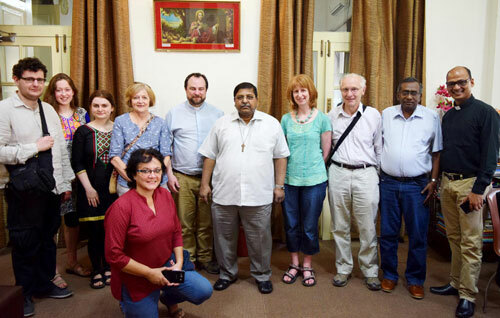 I write this having just returned from visiting our friends at St James Church Kolkata. We enjoyed a wonderful time and later this month the team and I will hold a presentation evening to tell you all about it. I greet you with joy in the name of Jesus Christ, our risen Lord and Saviour. Thank you Rev. Nick for asking me to write an Open Letter for your magazine, I am truly honoured and humbled. Isaac lived near his sister Ruth. While Isaac was a bachelor, Ruth was married and had three children. Ruth always worried about her brother as he lived alone. “Winter is around the corner and my brother will not think of keeping enough grain in his barn,” thought Ruth. So she decided to help. Knowing her brother would not willingly accept help, she sneaked out at night with a sack of grain and carried it across to Isaac’s barn and put it in a corner. In the meantime, Isaac was worrying about his sister Ruth. “Winter is coming and my dear sister has so many mouths to feed, I must help her, but without her knowledge. She is so stubborn when it comes to accepting help.” thought Isaac. So, he sneaked out at night with a sack of grain and carried it across to Ruth’s barn and put it in a corner. This went on for quite a few days, until it so happened that one day they met on the way to each other’s houses with the sacks of grain on their backs. Explanations and laughter followed. Isaac and Ruth put their arms around each other and with tears in her eyes, Ruth said “My dear Isaac this is truly a blessing from God that we love and care for each other so much that we want to share what we have. Let us see who needs help in our village and share our grain with them”. Isaac willingly agreed. Jesus conquered death on that Easter morn, thousands of years ago and today we all share in the good news of eternal life, news that we must share with others. I pray that more and more people become lights shining out through the darkness of sin, need and despair by giving love, hope through Jesus Christ, a sympathetic ear, a comforting arm, a warm meal, to those in need, not just during Easter, but the year round. I am personally filled with joy as I spent a few days in Dunblane last Summer and was truly overwhelmed by the way you shared God’s love with me and the team through the various wings of your Church, all the other activities and finally, by choosing St. James’ Church as your friend to expand God’s love. May the Lord fill you and your families with a joy that nothing in the world can give. I sign off by wishing each one of you and your families a very Happy and blessed Easter.